Pinterest, Houzz, Facebook, Twitter — each and every day I see amazing home transformations that delight and inspire. I’m constantly in awe of the skill and craftsmanship behind these remodeling projects. And, while smaller scale projects are suitable for ambitious DIYers, there’s something to be said for hiring a professional remodeler and getting the job done right. Both the National Association of Home Builders (NAHB) and National Association of the Remodeling Industry (NARI) issue a rally cry during the month of May to recognize the work of professional remodelers and encourage homeowners to tackle a long-awaited renovation or needed repair. Helping homeowners make smart renovation decisions is one of the benefits of working with a professional. 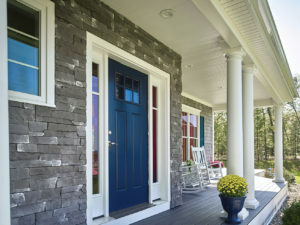 Coined “National Home Remodeling Month,” both NAHB and NARI seek to highlight this key component of the building industry and help remodelers shine and boost their bottom line. To launch the month NAHB recently announced the most common remodeling projects completed in 2017 and the winner is, the Bathroom Remodel! The results of its annual remodeler survey show bathrooms edged out kitchen remodels as the most often updated areas completed last year. This is a switch from 2016 when kitchens came out on top. Overall, remodelers bring curb appeal, comfort and value to our homes and that’s certainly something to honor and recognize during the month of May. Do you have an interesting remodeling project currently underway? If so, share you story here! Originally published in 2014, this article has been updated to reflect the latest research and home improvement trends. Looking for a professional to help you tackle your home renovation project? We can help. Are you are professional interested in CertainTeed’s credentialing programs? Give us a call at 1-800-233-8890 we’d love to have you on the team. Plus, 6 suggestions for homeowners that want to green their kitchen remodel and knock out curb appeal and improved efficiency with this (high yielding ROI) upgrade.